Buying an older bottle of a good beer on the liquor store shelf can be risky, but sometimes you get lucky and get something that has been "pre-aged". 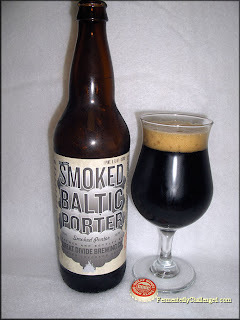 In late 2012, I found a bottle of a 2011 Great Divide Smoked Baltic Porter and kept it in the cellar until New Years Eve and broke it open to celebrate. And am I glad I did. The 2011 bottle had a 7.5% ABV rating and was perfect for cellaring. This 22oz bottle was bottled on June 28th, 2011 and held up wonderfully for a year and a half. I've had other smoked porters before and aging them did wonders to their complexity. I was hoping that time had done a similar job to this particular brand. Based on what I saw on the Great Divide website, it appears that they don't produce this beer any longer. 2011 was the last year of production. What a shame too as this beer had received great scores in the past. I was eager to celebrate New Years and tried this as my last beer for 2012. Appearance: The Smoked Baltic Porter poured very dark brown with only a bit of visibility along the edges. This 18-month old brew still had some carbonation and gave a healthy 1-2 finger head when poured cold. The head didn't last long and the lacing didn't cling to the glass, but that was to be expected from an older brew. I did not see any sediment in the 1st pouring. Aroma: The aroma of this beer was filled with sweet malts, smoke and bits of caramel, chocolate, dark fruits and toffee. It was a very pleasant smell and was very inviting. The smoke seemed a bit toned down, but that was expected. If this bottle had been freshly brewed then the smoke probably would have had more intensity. Taste: Oh man - dee-lish! There was a sweet underlying malt base with some roastiness and smoke. The brew was nicely bittered with German hops and drank very smoothly. It was an instant "Like" to my taste-buds. This was a full bodied brew that gave a nice warming effect. The roast took a back seat to the sweet smokey taste. This was a porter I could really get into. It reminded me a bit of the Alaskan Smoked Porter, but had a smokey characteristic all its own. The hop bitterness had also been subdued a bit as expected. I wonder just how long this bottle might have been cellared. I would love an opportunity to do age this beer further. Overall: If you ever spot this beer at your local liquor store GRAB IT QUICK! This is an absolutely top notch smoked porter that you'll want more than 1 bottle of. I certainly hope that Great Divide considers brewing this beer again. It's definitely one of the reasons why I seek out smoked beers at beer festivals. This beer makes my top pick list of 2012 I've tried. - Great Divide Espresso Oak Aged Yeti Imperial Stout review.